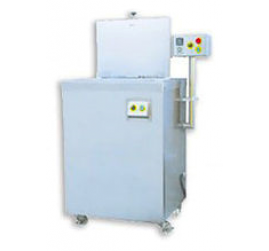 Type: Tank: 23.62 x 16.53" x 14.2"
HS42 is a manual type hot water shrink tank combine with vacuum packaging machine to produce vacuum skin pack and eliminate regular vacuum pack’s dog ear as well as create first grade vacuum pack and impression. This machine was built in rugged stainless steel construction and designed in easy to use, simply hook up with power source and press push / stop button to activate or stop machine. With quality component it can be continuously run and operation long term with perfect condition. All of Alpha Vac HS series hot water shrink tank are equipped with water proof control panel and cover for moisture anit-evaporation, in additional this type of machine also has well insulation even high temperature in dip tank and only feel warm outside machine. The electrical heating, water filling and draining connector for easy clean, low water warning system are standard equipped for this type of machine and optional for steam heating. Customer local voltage is available.